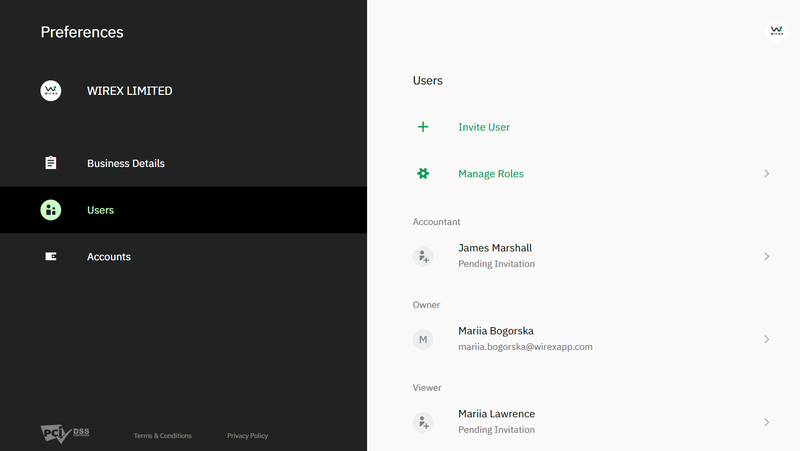 In Wirex for Business, you can assign different roles to your users. To do this, go to Preferences and select Users from the list of options. 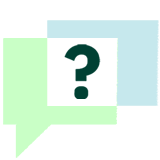 From here, you can see the list of your current and former users and invite new ones. To invite a new user to your account, click Invite User. You will be prompted to enter the new user’s first/last name, email address, and select their role. Instructions on how to proceed will be emailed to the new user. They will appear on the users list as pending and you will be notified once they have accepted the invitation. If you think the person you invited may have missed your email, you can resend it. You can also withdraw an invitation if you change your mind. To resend or withdraw an invitation, click on the user’s profile. 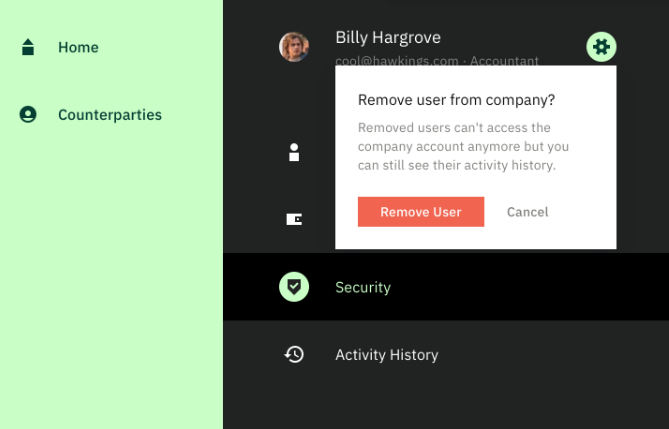 Note After you add a user, you can change their role or permissions (or remove them entirely), but you cannot change personal details like their name or address. Only a user can edit their own personal details. By default, there are 3 roles Owner, Accountant and Viewer. Owners have all permissions. They can conduct transactions, create new accounts, and add or remove new users, and approve transactions created by other users. Accountants can perform all operations except company profile management. While Accountants can perform money operations, operations over £1000 will need to be approved by the owner (in future releases, you may be able to customize this number). Viewers have read-only permissions. They can view accounts, counterparties, and transaction histories, but cannot initiate any operations. You can decide which accounts a user can and can’t work with. To do this, click on the user and select Accounts. Then use the toggles to decide which accounts this user can see. Note: If you hide an account for a user, they will not be able to see or work with that account. They will however, still be able to see transactions in the transaction history that involve any account that they do have access to, even if that transaction also involves an account that they don’t have permission to view (the hidden account will be displayed as a crypto address or IBAN number). In other words, you can hide specific accounts but not specific transactions. Accountants need Owner approval to Send or Exchange any amount over £1000 (you can customize this amount). When an Accountant initiates a transaction in an amount over their allowed limit, the transaction will be sent for Owner approval before it is processed. To approve transactions as an Owner, navigate to Recent Activity, and look for any on transactions on the list that have “Awaiting Approval” status. Click on them to see more details. 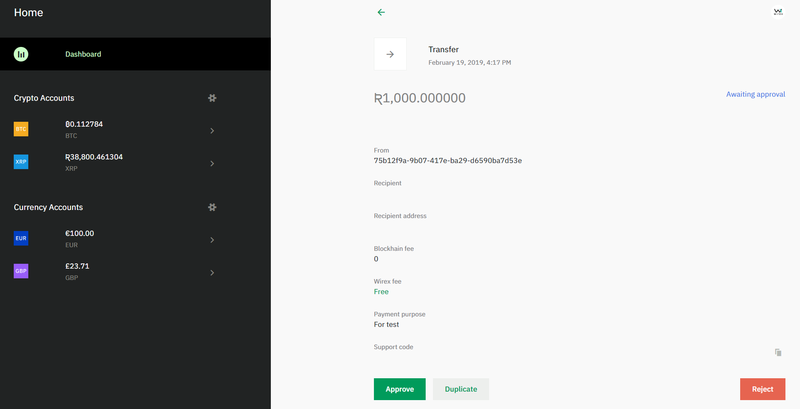 When you click on transaction awaiting approval, you’ll be taken to a screen with more detailed information about the transaction, and the option to reject, duplicate, or approve the transfer.Click Reject to cancel the transaction, or click Approve to complete the transaction. To remove a user, just click the preferences icon next to their profile, and select Remove User. The user will now be removed from the company’s account. You can still see their account history,but they can no longer access the company account or perform new actions.